Summertime is the perfect time to lose all of the gains our children and students have made throughout the course of the school year. While summer fun at the pool, camps, play dates, and special trips are essential, learning can not be shoved by the wayside. The summer slide is something that troubles me as a parent and teacher, so each year as a teacher-mom, I vow to incorporate learning time into our fun summer agenda. My challenge has been helping my incoming students. I do not teach in the same school district where my own children attend school, and I love seeing how two very different districts go about managing different tasks. 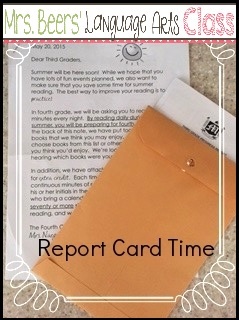 This year, I was most excited about what information was in my son's report card envelope, which I plan to implement in my students' report cards next school year. In addition to his end of year 3rd grade report card, the 4th grade language arts teachers added a sweet letter about continuing learning throughout the summer with a Recommended Book List and a Parent Signature Chart to document daily summer reading. As a teacher-mom, I LOVE this! 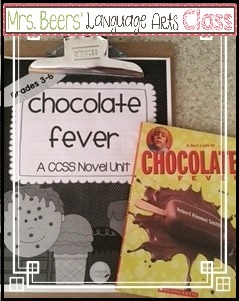 What perfect information to help students get better acquainted to 4th grade, as well as share with families a strategy to continue reading throughout the summer! Why didn't I think of this?! The Recommended Reading List includes over 20-specific book titles,in addition to 4th grade level authors and different age-appropriate series of texts. 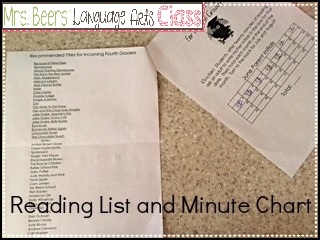 While I can easily grab many of these suggested books from my own 6th grade classroom library to share with my son, it offers non-teaching parents the chance to take this list to the library or Half-Price Books to find suitable books for daily reading. When reading has been completed for the day, a parent just signs off with their initials. There are charts for June, July, and August to keep students aware of the expectations of reading throughout the entire summer. The tricky part for my son is that I am a READING TEACHER! Sorry, Bud! 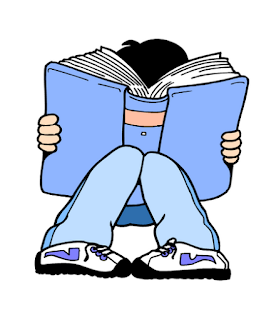 Reading gets completed each day, without fail, and I also have some ready-made novel units matching some of these recommended books that he gets to complete to enhance his comprehension. While I can't mandate daily summer reading for anyone other than my own children, I can provide tools to benefit my future students during the summer months to set them up for as much literacy success as possible. Keep me posted on any ideas you have or implement to help prevent the summer slide with your own children and students! 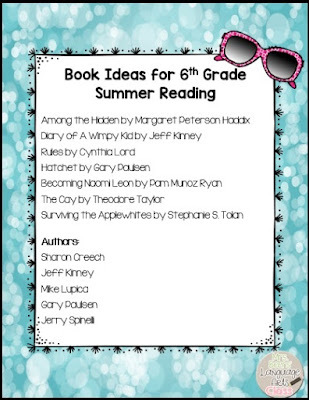 Happy Summer and Happy Reading!